For decades, environmentalists have been rightly concerned about the environmental impact of humanity’s food systems. Often, this has meant advocating for shifting diets — in particular, away from meat, given its outsized environmental impact. A recent, much-publicized example is the EAT-Lancet Commission’s new report, whose flexitarian dietary guidelines include some, but not much, meat. But what’s often been missed in the discussion of these guidelines is that in terms of environmental impacts, how much meat you eat might matter less than what kind of meat you eat. What if shifting from one type of meat (beef) to another (monogastrics, like pork and poultry) offered environmental benefits at least as large as simply reducing meat consumption across the board? As this figure shows, beef is simply much, much worse for the environment than all other forms of food, due mainly to enteric methane and the large amount of land required to feed cattle. The most meaningful distinction isn’t animal vs. plant — it’s beef (and other ruminants like sheep and goat) vs. everything else. This is not to say that monogastrics don’t have higher impacts than plant-based foods – they do. But simply switching from beef to pork and chicken might get us nearly as far as some forms of flexitarianism and vegetarianism. In fact, it might, in practice, get us further. What’s often forgotten is that when people reduce their meat consumption, they often substitute it to some degree with dairy, which, due to the large emissions from land-use change associated with pastureland, actually has higher greenhouse gas emissions per calorie than either chicken or pork. Dairy has 25% higher emissions than chicken, and 160% higher emissions than pork, according to a new report from the World Resources Institute. What this means is that substituting chicken or pork for beef is far better for the environment than substituting dairy for pork and chicken. And as the figure below shows, a diet including chicken and pork, but no dairy or beef, has lower greenhouse gas emissions than a vegetarian diet that includes milk and cheese, and almost gets within spitting distance of a vegan diet. Further diminishing the benefits of vegetarianism, a diet of plant-based protein effectively means replacing high-yielding livestock feeds like corn with low-yielding legumes like beans and lentils. This still results in greenhouse gas and land savings, but not as large as one might expect. 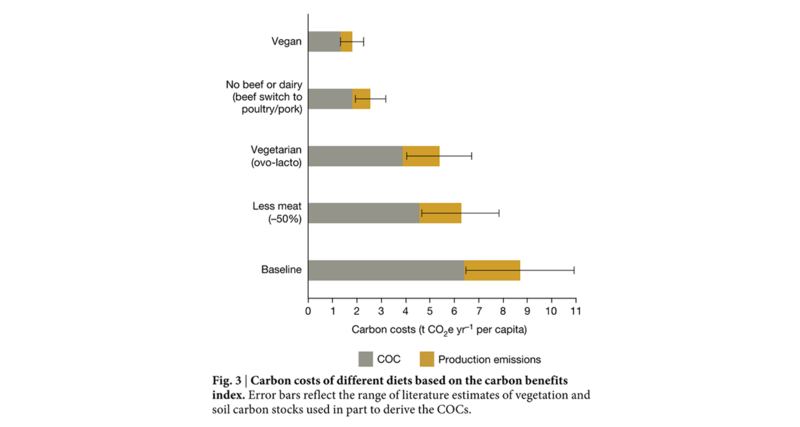 For example, the vegetarian scenario in the Lancet study has lower greenhouse gas emissions than the flexitarian scenario, but the land requirement is virtually the same. 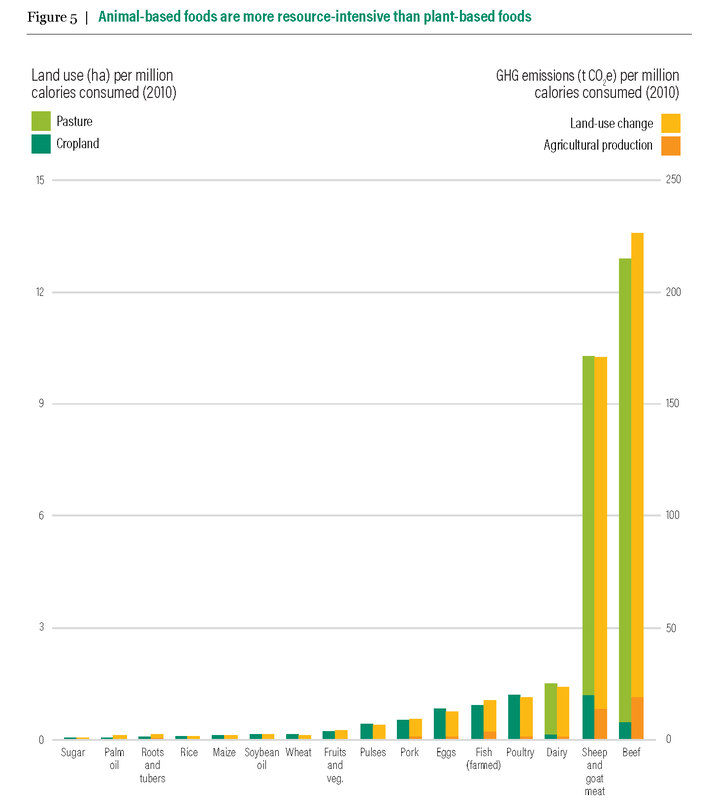 A full accounting of the greenhouse gas emissions associated with land-use change might close the GHG gap even further. Cellular meats like the kind being developed by Memphis Meats offer a vitally important environmental solution, and perhaps an even bigger animal welfare solution. But according to the most recent estimates of the prospective impacts of lab-grown beef, its greenhouse gas emissions are as high or even higher than those of pork and chicken, and its land requirement might be about the same. So if you want to reduce the environmental impact of your meat consumption, you can absolutely eat a cellular meat burger. Or you can just eat a chicken sandwich. The huge greenhouse gas sparing potential from simply switching from beef to pork and chicken is good news, since both research and common sense indicates that a diet of plants and monogastrics is easier to stick to than strict vegetarianism, whose adoption remains stubbornly low in most developed countries. Veganism, while environmentally superior, is an even harder sell, with about 3% adherents in the United States and 2% in the UK. By contrast, we’ve actually seen evidence of large-scale shifts from beef to chicken and, to a lesser degree, pork in the Western world. 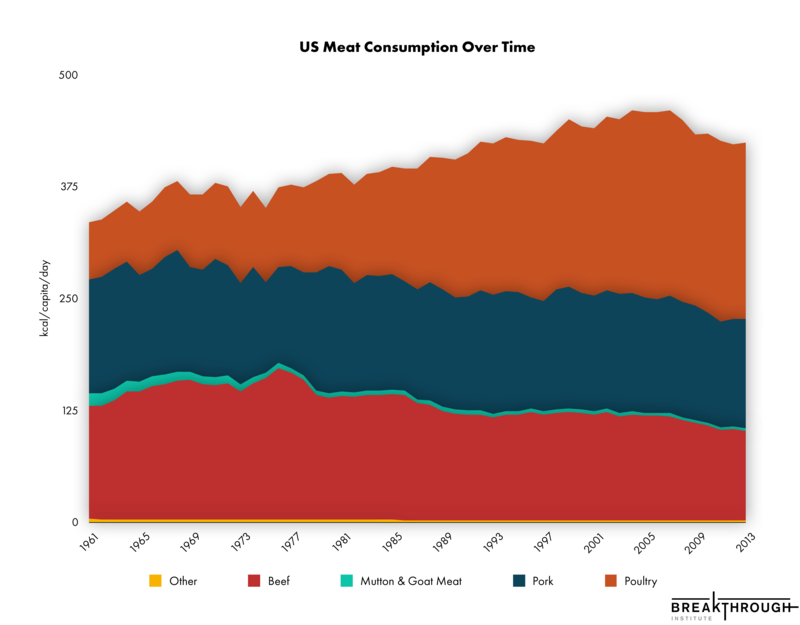 In the US, beef consumption declined from 169 kcal/capita/day at its peak in 1976 to just 100 kcal/capita/day in 2013 (the last year FAO has data on consumption) — a drop of over 40%. At the same time, consumption of poultry has more than doubled in this time period, from 89 to 197 kcal/capita/day. This substitution alone, in spite of total meat consumption rising by 15%, was enough to cut per-capita greenhouse gas emissions by one-third. On top of that, production efficiencies have been increasing. Accelerating these trends would be a big boon for the environment. Cutting back on beef, or any dietary change for that matter, is not likely to be remotely enough to keep agricultural land use and greenhouse gas emissions from rising, since total demand, especially in developing countries, is set to increase rapidly. That’s why it’s so important to also think very hard about the supply side. As I’ve written previously, by using more productive grasses, veterinary care, and grain-finishing (basically, feedlots), we can maximize resource efficiency and productivity while minimizing beef’s climate and land-use impacts. These improvements in production make sense at any level of consumption. Still, now and in the future, lower beef consumption in most rich countries would be preferable. Shifting toward chicken and pork is not the only option, but of those that offer comparable environmental benefits, it is arguably the path of least resistance.